Snippets of Jack: "Think Like Jack"
Will: "He thinks we're a hallucination." Jack: "...William, tell me something: Have you come because you need my help to save a certain distressing damsel–or rather–damsel in distress? Either one." Will: "No." Jack: "Well, then, you wouldn't be here, would you? So you can't be here. Q.E.D., you're not really here." You tell him Jack. Well I suppose it might be a bit frustrating to have sailed to the end of the world to save someone who thinks you're not real. Eventually Jack is convinced that Will and the others are real and they set of to the land of the living. Will does love Elizabeth but when it comes to freeing his father he is willing to betray anyone including his piratey friend Captain Jack Sparrow. . .
After arriving into the land of the living, in the Black Pearl, Will convinces Jack and Barbossa to go onto an island to get supplies leaving him in command of the ship. What Barbossa and Jack don't know is that Pirate Lord Sao Feng and his men is waiting for them, courtesy of Will Turner. After Will ends up betraying Jack to Sao Feng, Sao Feng gets a bit worried that Will will not keep his promises. Sao Feng:"You crossed Barbossa, you were willing to cross Jack Sparrow; why should I expect any better?" Will:"I need the Black Pearl to free my father; you're helping me to get it." Spoken like a true pirate. Jack being Jack, however, finds away to escape Sao Feng and Beckett and sails his ship to Shipwreck Cove. Will is also on board the Black Pearl begins to drop dead bodies and barrels in hopes of leading Beckett and the Royal Navy also to the Cove. 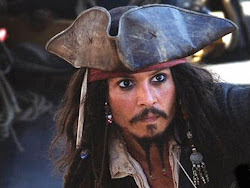 Captain Jack, however, discovers this all this sneaking around. Will: "I said to myself, 'think like Jack.'" Jack: " This is what you've arrived at? Lead Beckett to Shipwreck Cove so as to gain his trust, accomplish your own ends? It's like you don't know me at all, mate. And how does your dearly beloved feel about this plan? Ah, you've not seen fit to trust her with it." Having some doubts about Elizabeth and women? Now that does sound like something Jack would do. Jack then throws Will overboard with a barrel, but leaves him one very valuable object: his compass. Will gets picked up by Lord Beckett, just the way he planned and has a nice chitchat with Beckett and Davy Jones. Jones is shocked to see Will alive, because he assumed that he died during the kraken attack shortly after escaping the Flying Dutchman. But this surprise doesn't even compare when he finds out that Jack too has survived the kraken's attack on the Black Pearl. Will agrees to lead Beckett to Shipwreck Cove, but Beckett doubts that Will would be able to. Will smiles, pulls out the compass, and responds, "What is it you want the most?" And so they sail to Shipwreck Cove. Let the war begin!